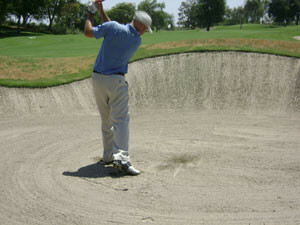 One of the more difficult shots a golfer may face on the course is a bunker shot that is 40 to 60 yards from the green. Let me suggest using the splash shot technique… but instead of a sand wedge… use a pitching wedge or a nine iron. 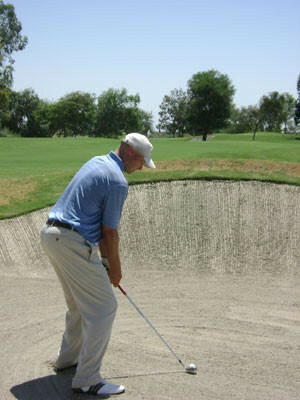 Set up the same way you would set up for a regular shot out of the sand, open the clubface and then open your body. Play the ball off your left instep. Set your weight on your left foot to promote a steeper swing. 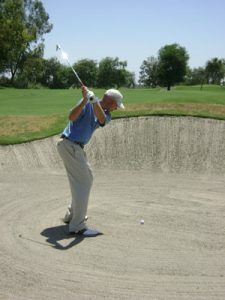 The goal is to enter the sand one or two inches behind the ball and slide the club through the sand to make the ball carry farther than it would using the sand wedge. You will notice that the pitching wedge goes slightly lower than the sand wedge and the 9 iron even lower. I suggest practicing this shot before using it on the course to see how the ball reacts to using the different lofts; this will help determine if the wall of the bunker is too high for this shot.